Black and white photograph with ball point pen noting Seasoning Room (Blacks) at the Boston Mat Leather Company, Peabody, Massachusetts, 1918. Three men are in the photograph. Two stand at a long table to the viewer's left. Windows line the wall behind it. The man closest to the camera has a small bucket before him and has dipped his hand in. The man in the center seems shocked by his expression. The man at the back stands behind some wooden horses holding hides. 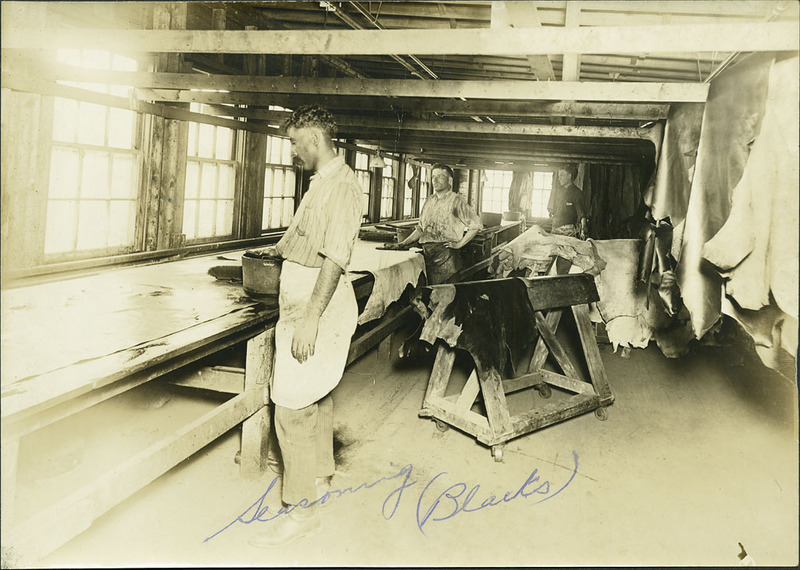 “Seasoning room (blacks),” Peabody Institute Library, Peabody, Mass., accessed April 20, 2019, https://digitalheritage.noblenet.org/peabody/items/show/178.